Parents of young students often struggle with care options between the time that school is released and they get done work. HOULTON, Maine — Parents of young students often struggle with care options between the time that school is released and they get done work. For many families, it means shuttling their children to daycare facilities and then returning to work. 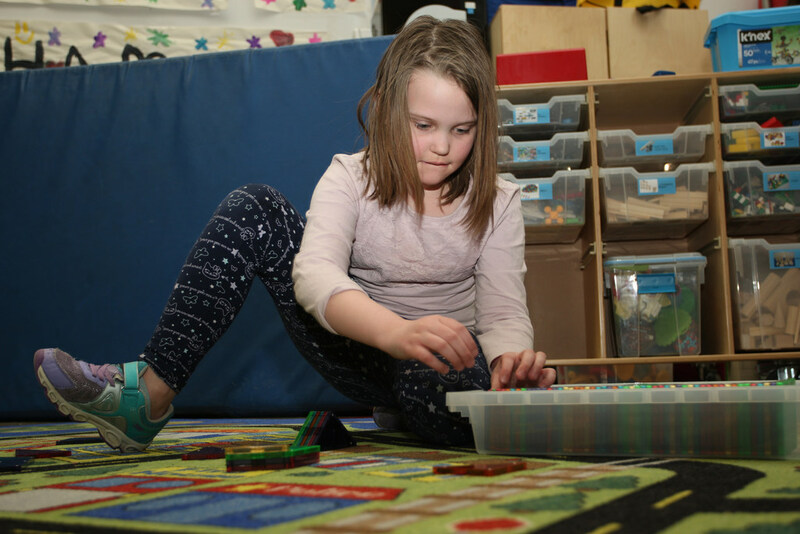 To help with this transition, RSU 29 has partnered with Champions, a national after school program open to any children in pre-kindergarten to sixth grade. About 16 students are currently participating in the program, but officials are eager to expand that number. RSU 29 Superintendent Ellen Halliday said Friday that the Champions program was added by the district to help fill a need for after school care and support for students. Halliday said her interest in adding the program to RSU 29 was to give parents another avenue for opportunities for their children after school. Houlton and Presque Isle are currently the only two school districts in the state that have partnered with Champions. Christine Hunt serves as the site director at Houlton Elementary School, while Tara Challoux serves as one of the instructors. The program runs from 2:20 p.m. to 6 p.m. Monday through Friday at the Houlton Elementary School. On early-release days for the district, the program begins at 11:30 a.m. The company operates on a 13-to-1 student to staff ratio. That curriculum includes time each day to explore their own interests in areas like creative arts, library, math/construction, puzzles/games, science/computers and physical activity/fitness. Storm Mathias, area manager for Champions, said that as a member of the KinderCare Education family of brands, Champions is backed by the resources and expertise of one of the world’s largest education companies. 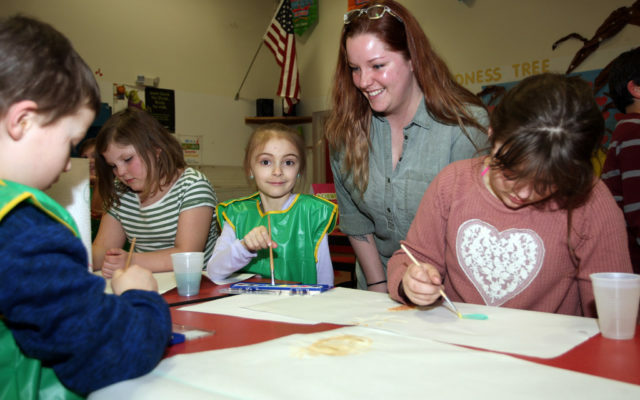 KinderCare Education serves 200,000 children in 39 states, and Champions specifically serves more than 19,000 of those children in 16 states and Washington, D.C.
Storm Mathias, area manager for Champions, was at Houlton Elementary School Feb. 6 to check out Champions latest program. 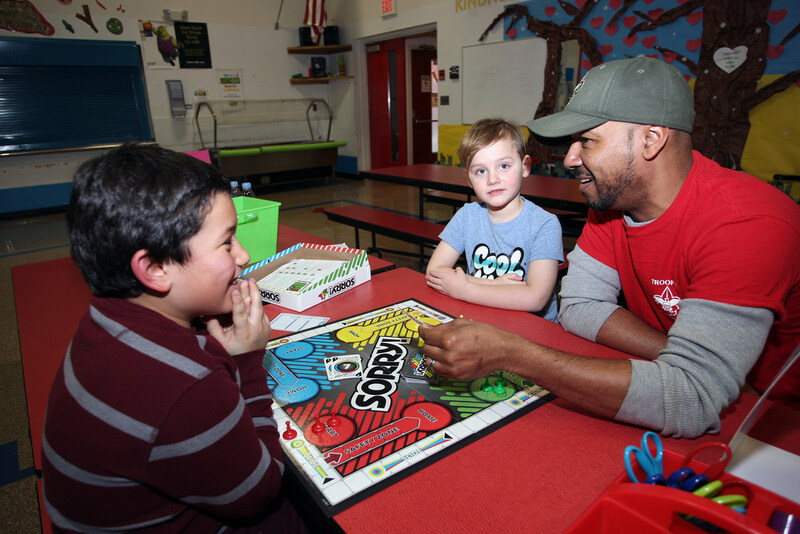 Mathias, far right, is seen playing a game of “Sorry” with Reuben Redmond, left, and Jude Robinson. While Champions charges a fee for its service, it is very much in line with other child care options, Halliday said. The cost is $38 per week for 1-2 days enrollment; $57 per week for three days; $66 per week for four days; and $75 per week for five days. Discounts are available for multiple children in the family, military and district employees. During the month of February, the program is providing two free trial days for any students to check out the program. Subsidy assistance also is available for those who wish to enroll their children, but are unable to afford it. For more information on the Champions After School program visit: www.discoverchampions.com.